You can set the new size by either dragging the edges of the frame or by entering the picture width and height (both in pixels and percentage). You can also select whether to keep or ignore the aspect ratio. When you check the "Preserve aspect ratio" box, image proportions won't be changed. 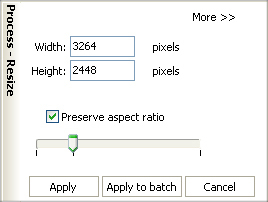 More settings available for the Resize, Rotate, Projective, Anti projective and Horizon strengthening options include Lanczos resampling, Linear resampling, Mitchell resampling and Nearest resampling. Resampling changes the number of pixels in an image, and is used to achieve a better output when the image size is in any way changed.